NES Battletoads (USA) "warpless, 1 player" in 21:38.38 by feos, Alyosha & Samsara. 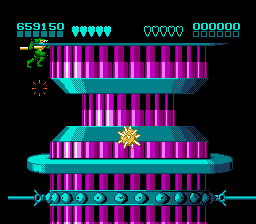 Battletoads (1991) is a futuristic beat 'em up game known for its extreme difficulty spread over 12 difficult levels. The mechanics in the game also change drastically from level to level, making the game one of the hardest and most varied for the NES. In this run, feos, Alyosha, and Samsara improved upon the previous publication by 2:39.33 using many new tricks and glitches.